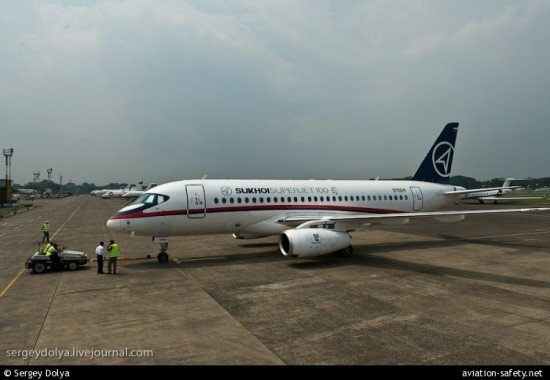 An investigation by the Indonesian National Transportation Safety Committee (NTSC) concluded that the crew of a Sukhoi Superjet that crashed on a demonstration flight near Jakarta, Indonesia,were not aware of the mountainous area surrounding their flight path and disregarded the TAWS warning. On May 9, 2012, the Superjet passenger plane flew into a near-vertical mountainside on the eastern side of Mount Salak at an elevation of 6,100 feet. All 45 on board were killed. The flight was organised by the Sukhoi Civil Aircraft Company and most of the passengers were potential customers from Indonesia. Prior to the demonstration flight, an IFR flight plan was filed with a flight altitude of 10,000 feet and an estimated duration of 30 minutes. Some six minutes after takeoff from Jakarta-Halim Airport, the pilot contacted Jakarta Approach and requested a descent to 6,000 feet and subsequently requested to make a right orbit. Both requests were approved by Jakarta Approach controller. The airplane struck Mount Salak in the process of performing the orbit. The crew were not aware of the mountainous area surrounding the flight path due to various factors resulting in disregarding the TAWS warning. The Jakarta Radar service had not established the minimum vectoring altitudes and the system was not equipped with functioning MSAW for the particular area surrounding Mount Salak.